The Palomar knot is an excellent knot for braided lines. 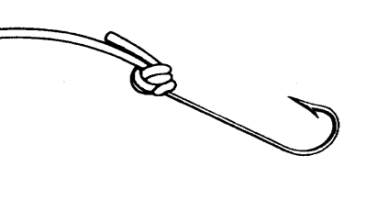 Conventional knots tend to slip with braid. The Palomar Knot is easy to tie correctly, and consistently the strongest knot known to hold terminal tackle. Used to firmly tie on hooks, swivels, lures, whatever! Not just for braid. Use it for any type of line for a secure knot. 1. Double about 6" of line and pass the loop through the eye. 2. 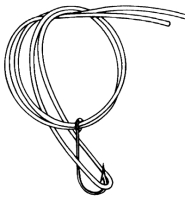 Let the fishing hook hang loose, and tie an overhand knot in the doubled line. Avoid twisting the lines and do NOT tighten the knot. 3. 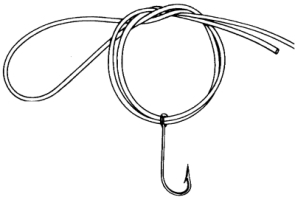 Pull the loop end of the line far enough to pass it over the hook, swivel or lure. Make sure the loop passes completely over the attachment. 4. Moisten the line & pull both the tag end and the standing line until the knot is tightened. Clip off the tag end of the fishing line.